This paper addresses mobility control routing in wireless networks. Given a data flow request between a source-destination pair, the problem is to move nodes towards the best placement, such that the performance of the network is improved. Our purpose is to find the best nodes selection depending on the minimization of the maximum distance that nodes have to travel to reach their final position. We propose a routing protocol, the Routing Protocol based on Controlled Mobility (RPCM), where the chosen nodes' path minimizes the total travelled distance to reach desirable position. Specifically, controlled mobility is intended as a new design dimension network allowing to drive nodes to specific best position in order to achieve some common objectives. The main aim of this paper is to show by simulation the effectiveness of controlled mobility when it is used as a new design dimension in wireless networks. Extensive simulations are conducted to evaluate the proposed routing algorithm. Results show how our protocol outperforms a well-known routing protocol, the Ad hoc On Demand Distance Vector routing (AODV), in terms of throughput, average end-to-end data packet delay and energy spent to send a packet unit. However, this routing algorithm does not take into account the mobility as a new design dimension. In this paper, we take the controlled mobility into account by investigating the performance of a wireless network, where all the devices are equipped with mobility unit. The idea is to use existing multihop routing protocol; specifically we consider the well-known routing algorithm AODV and achieve further improvements in terms of network performance as throughput, data delay, and energy spent per packet, by explicitly exploiting mobility capabilities of the wireless devices. Previous analytical results formulated in [6–8] suggests that controlled mobility of nodes helps to improve network performance. Based on these results, we consider jointly controlled mobility and routing strategies. We perform simulations through a well-known simulation tool  to quantify the throughput, delay, and energy spent per packet compared with wireless network where AODV is used. The rest of the paper is organized as follows. Section 2 is the related works. We give some practical application example in Section 3. We give details about Routing Protocol based on Controlled Mobility in Section 4. Section 5 is related to simulation, and finally we conclude our work in Section 6. In the recent past a lot of works studied the effects of mobility in the networks. Often, devices' mobility has been regarded as a negative fact that causes link break, disconnections, and so forth. From a certain moment it has been understood that mobility of nodes can potentially be used to improve perfomance of the network. Grossglauser and Tse  showed that mobility increases capacity of a network. Unfortunately, they did not take into account the delay in their work. The research community investigated throughly the delay-throughput trade-off and some interesting results have been obtained. In fact, Gamal et al. determined the throughput-delay trade-off in a fixed and mobile ad hoc network. He showed that, for nodes, the following statement holds , where and are the delay and the throughput, respectively. For a network consisting of mobile nodes, he showed that the delay scales as , where is the velocity of the mobile nodes. Once the trade-off between delay and throughput has been characterized, some algorithms that attain the optimal delay for each throughput value have been proposed. Another model makes it possible to exploit the random waypoint mobility of some nodes, in order to design a routing algorithm that allows high throughput with low delays, where the delay depends on the nodes' mobility, while the throughput is independent of it . De Moraes  showed that there is a trade-off among mobility, capacity, and delay in ad hoc networks. A first step in taking advantage of the possibilities that mobility introduces has been made by the research community when predictable mobility became an important research focus. In fact, researchers studied many specific network objectives, under a random mobility-based communication paradigm; nevertheless the mobility of the sinks, for example in military applications, is based on soldier or fire fighter movements, and thus, it is predictable, in substance. Generally, the existing research in wireless sensor networks considers sink movement based on random mobility. However, the trajectories of the sink, in many practical applications, can be determined in advance. Based on these considerations, Lee et al. 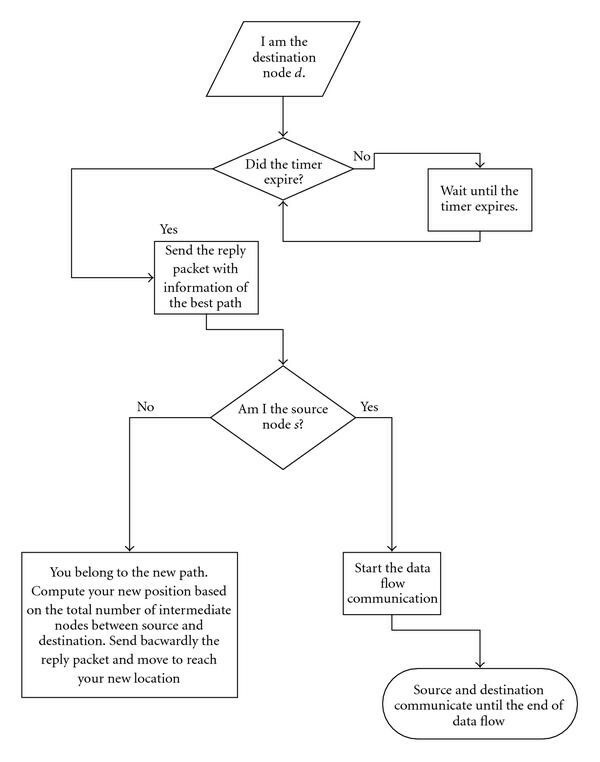 proposed a predictable mobility-based algorithm, which uses the existing dissemination protocols and it is based on the random mobility-based communication paradigm. He showed the improvements and the various advantages of using the predictable mobility-based communication paradigm as the energy consumption decreases and the network lifetime increases. Predictable mobility of nodes has also been exploited to help in packets delivering . In this work, nodes routing tables are updated with link state and trajectory information, which are received from other nodes. The problem of routing related to the predictable mobility has also been analyzed by . In this work, paths are created by the movements of nodes, which will deliver the message they are carrying when they find other suitable nodes. The space-time routing framework it proposed leverages the predictability of nodes motion. Controlled mobility has been a hot research topic of the robotics community for many years. It concerns the motion coordination of a group of robots for a common objective, typically the coverage of a geographical area. In , the authors consider the problem of deploying a mobile sensors network composed of a distributed collection of nodes equipped with locomotion capability. Such mobile nodes use their ability to move in order to maximize the area covered by the network. Their approach is based on a potential-field approach and nodes are treated as virtual particles, subject to virtual forces. The concept of controlled mobility is also used by  by considering a hybrid network with both static and mobile nodes, which fully exploits the movement capability of the sensors. In  authors consider jointly mobility and routing algorithms, but the solution they proposed is based on the base station as the only controlled mobile device. In this work we are interested to consider the mobility of devices in a controlled fashion along with the routing algorithm. Specifically, we base our proposal on the analytical results obtained in [6, 8] that show the potential advantages obtainable through controlled mobility. In , it was not possible to take into account all the constraints of a real routing algorithm and, for this reason, we implemented RPCM in a well-known simulation tool, ns2. In this section we will give some practical applications of Controlled Mobility. There is an interesting real application of controlled mobility to reduce power consumption realized by Intel, that showed that a few motes equipped with 802.11 wireless capabilities can be added to a sensor network in order to act as wireless hubs . Load balancing through controlled mobility in wireless sensor networks is studied by Luo and Hubaux in . The nodes closest to the base station are the bottleneck in the forwarding of data. A base station, which moves according to an arbitrary trajectory, continuously changes the closest nodes and solves the problem. The authors find the best mobility pattern for the base station in order to ensure an even balance of network load on the nodes. Recently, Intel installed a small sensor network in a vineyard in Oregon and a second one in Northern California to monitor microclimates and Redwood canopies, respectively. In this context, the mobile sensors had to measure, share, and combine the collected data regarding temperature, humidity, and other factors. At the gateway, the data was interpreted and used to help avoid mold, frostbite, and other agricultural problems. The agricultural environment is just an example of how a sensor network can take advantage of mobile robot's capabilities for data gathering and interpretation. Furthermore, sensors often need to be recalibrated and a robot could act as a gateway to the sensor network and perform calibration tasks. An interesting application of sensor devices with mobile robots, related to coverage, is for people with disabilities [20, 21]. In fact, technical devices, such as mobile robots, can aid personal assistance. A mobile robot requires a sensing system in order to control the path of movement and the surrounding environment. The robot can be equipped with sensors for detecting distances and obstacles. Another work worth mentioning has been conducted by Kansal et al. in . The authors do not present an algorithm for the optimization of some parameters; instead they propose Morph as a new vision of sensor networking, where controlled mobility is considered as an additional design dimension of the communication protocols. They argue that, in Morph, controlled mobility can be employed for the sustainability of the network, which consists in both alleviating the lack of resources and improving the network performance. The network scenario we consider consists of all nodes able to move and control their movements. The communication strategy used in this work considers different paths for each pair source-destination nodes and the best path is selected to be used for data communication. The choice of the best path is based on a metric. Specifically, in this context we consider the path whose nodes have to travel the total minimum distance to reach the evenly spaced positions on the straight line between the source-destination pair. The same metric has been proposed in an optimization model in , where the model determines the placement that minimizes the total travelled distance of the sensor nodes. This kind of movement could be useful in all situations where a mobility too high can be dangerous (i.e., military applications such as minefields monitoring) or difficult because of a high presence of obstacles. Assume that nodes deployed randomly in a square area. All the nodes have the same transmission range. If two nodes are within each other's transmission range, they can communicate directly and they are neighbours. Otherwise they have to rely on intermediate nodes to relay the messages for them. Any node in the network may have data to be sent to any other node. The path from a source to a destination may not be direct but involves other intermediate nodes. We assume that several paths, from the source to the destination , have already been discovered by a routing protocol. Specifically, we apply the Route Request phase of the AODV protocol, with some additional information such as the nodes' position. We need this information for implementing our protocol as explained in the follow. We also assume that nodes move only in order to reach specific locations when they belong to a path. Our mobility control scheme is not directly incorporated into a specific layer of the classical ISO/OSI layer structure (i.e., physical layer, routing layer, etc.) but is orthogonal to this kind of subdivision as we can observe in Figure 1. In fact, controlled mobility could be exploited at different levels. Protocols' stack integrated with mobility management. In this section we detail the routing protocol along with the mobility algorithm. Assume that a source node needs to establish a communication with a node . The source node will broadcast a Request Packet, which will be forwarded by its neighbours. Each node includes in the request packet its geographical coordinates in the network. Once the Request Packet reaches the correct destination, the node will not send a Reply Packet immediately, but it will wait for processing other requests. In order to avoid unuseful delay, a destination node will wait for a specific time, and then it will send a reply packet by building the best selected path. 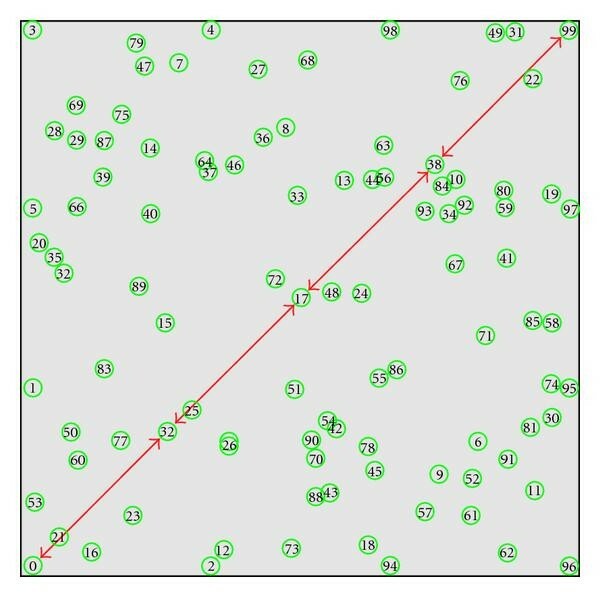 The metric we introduced to evaluate the goodness of a path is based on the total travelling distance. 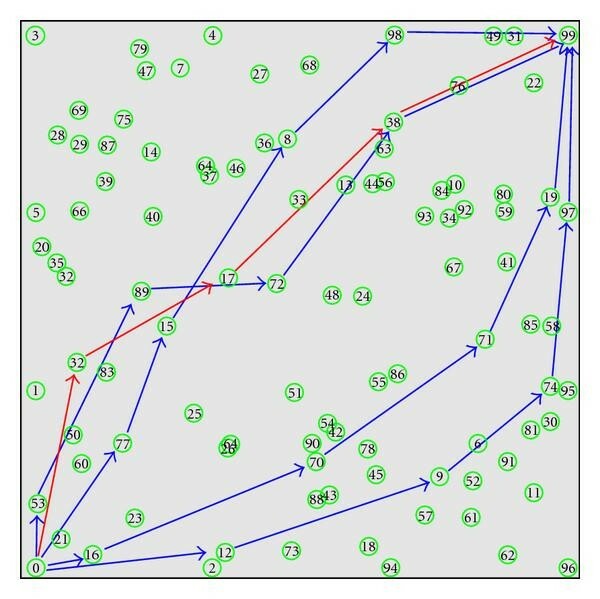 In practice, the algorithm will choose the path that minimizes the sum of nodes' travelled distances. Other metrics, such as the minimization of the maximum travelled distance, could be considered and implemented. In Figure 2 the request phase of the routing protocol is explained. We can observe that the source node starts a request phase by sending a Route Request and every intermediate node stores the position of the previous node, the ID of the previous node, and rebroadcasts the request packet. The mechanisms to avoid loop and control packet storms are the same as in AODV. 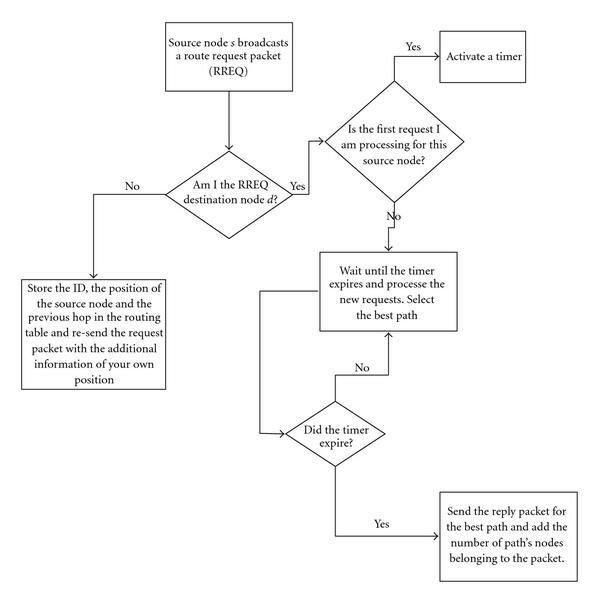 Once the Request Packet reaches the destination node, if the request is processed for the first time, the destination node activates a timer and continues to process other Request Packets of the same source node . Otherwise, compares the previous path with the current path and selects the best one (in this case the path whose nodes travel the minimum total distance). Once the timer expires, sends a Reply Packet to the first node of the selected path in the backward direction. This node computes its new position depending on the number of nodes involved in the path (this information is sent from the node) and forwards the Reply Packet to the following node in the backward direction (this information has been stored in the Routing Table during the Route Request phase). Hence, this node will move to the evenly spaced position on the straight line between the source and the destination. When each relay node knows its position, the optimal configuration of relay nodes for an active flow is established as in [6, 23]. It is worth to note that in this case the solutions found in [6, 23] are the same, because the initial energy of nodes is the same. In practice, the nodes will reach the evenly spaced positions on the straigth line between the source and the destination. In Figure 3 the Reply phase is explained. Once the source node receives the Reply Packet, all the nodes belonging to the path have already moved to their new position and will start the data communication flow. Routing Request phase of RPCM. In practice, nodes compute their new positions based on the total number of nodes belonging to the current path and considering they have to be evenly distributed on the straight line between the source and the destination. The Mobility Algorithm can be summarized as follows. Mobility control at each relay node. Each node acquires the information of the new position it has to reach when the reply of the request is received. The new position is on the straight line between the source and the destination and each node will be positioned in an evenly distributed fashion. Each node that received a reply packet moves towards its new position. In , authors had to introduce a damping factor to avoid oscillations in the network. In fact, nodes exchange local position information with neighbours and some iteration of the distributed algorithm is needed to reach the final optimal displacement of the nodes. Thus, we do not need to introduce any damping factor, because nodes already have all the information they need to reach the new location. Furthermore, we do not have any convergence concern. In fact, nodes start to move once they receive the reply packet and reach the final destination. in the nodes' routing tables: source's position and hop number of the source-destination path. The effect of applying the RPCM protocol is shown in Figures 4 and 5. A snapshot of the network before applying the Routing Protocol. A snapshot of the network after RPCM is applied. In Figure 4 we can observe the selection of many potential paths for the pair source-destination, nodes 0 and 99, respectively. Specifically, the paths discovered are 0-53-89-72-38-99, 0-77-15-8-98-99, 0-16-70-71-19-99, 0-12-9-74-97-99, and 0-32-17-38-99. Among the different paths, the one whose nodes travel the total minimum distance is chosen. In this case the selected path based on our metric is 0-32-17-38-99. When the reply phase begins, the first node that receives the reply packet is node 38, it computes its new location and sends the reply packet to the node 17, and then it moves towards its best location. In similar fashion, node 17 receives the reply packet from the node 38, computes its new destination, sends the reply packet and moves to the new location, and so forth. Once node 0 receives the reply packet from the node 32, then all the nodes belonging to the path (in this case, nodes 38, 17, and 32) already moved to their new positions and node 0 starts the data communication flow to node 99. Note that source node and destination do not move. As we already said in the previous subsections, the optimization model including the minimization of the nodes' total travelled distances along with other possible metrics has been introduced in . Unfortunately in that analytical work, many practical details could not be taken into consideration. For this reason, we chose to implement one of those possible metrics in a complete routing algorithm and simulate its behaviour in a well-known network simulator: ns2, in order to evaluate the realistic effects of controlled mobility in the routing process in comparison with the AODV protocol. energy spent for received packet. We ran 10 simulations for each scenario and average the results in order to reach the 95% of statistical confidence. We performed two simulation campaigns: the first consists of increasing nodes density for a fixed number of flows ( ), in the second the number of flows varies between 4 and 12 and the nodes density is set to . Figures 6, 7, and 8 show the performance of the two algorithms for the first simulation campaign in terms of throughput, delay and energy spent for received packed, respectively. 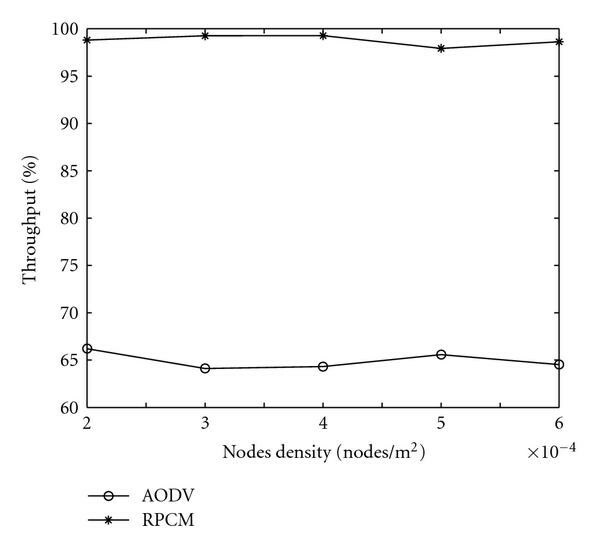 Performance of AODV and RPCM in terms of throughput, when . 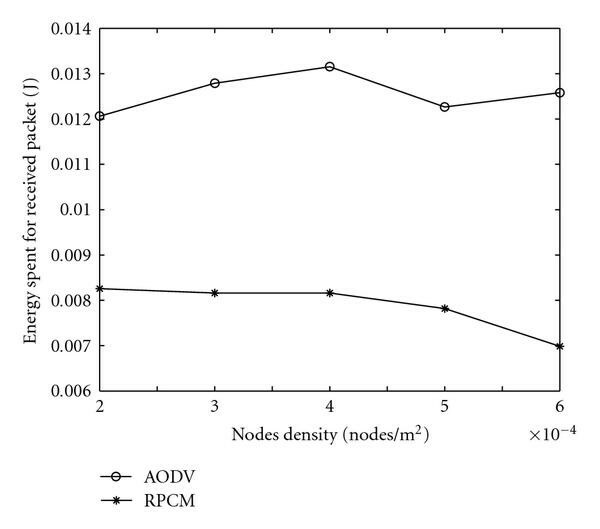 Performance of AODV and RPCM in terms of delay, when . Performance of AODV and RPCM in terms of energy spent for received packet, when . As we can see, for all the output parameters our scheme out performs the AODV achieving 30%, 80% and 40% of improvements for throughput, delay and energy spent for received packet, respectively. 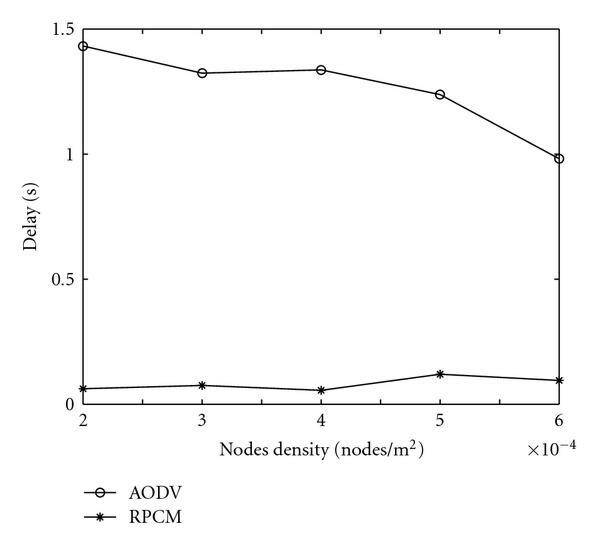 Furthermore, the behavior of the RPCM scheme is more robust and scalable than the AODV, since it is almost constant for all output parameters when density, while in the AODV scheme, delay and energy spent are affected by the nodes density. Figures 9, 10, and 11 show the performance of the two algorithms for the second simulation campaign in terms of throughput, delay and energy spent for received packed, respectively. 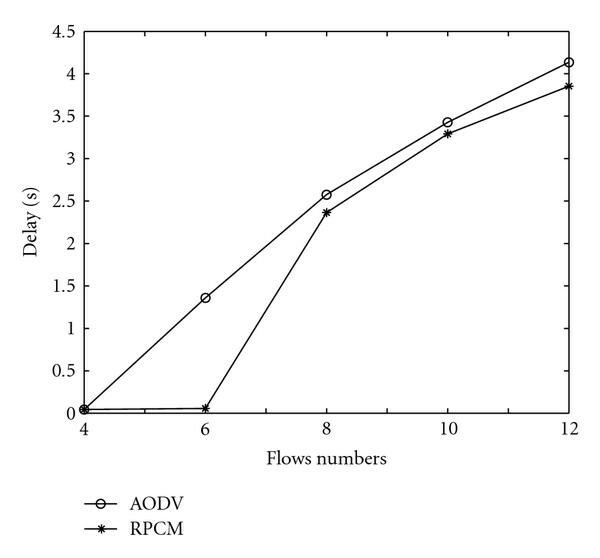 Also when the number of simultaneous flows varies between 4 and 12, the throughput of RPCM results 30% higher than the AODV on average. The delay is still lower for the RPCM, even if, when the number of flows increases, the improvement tends to reduce. 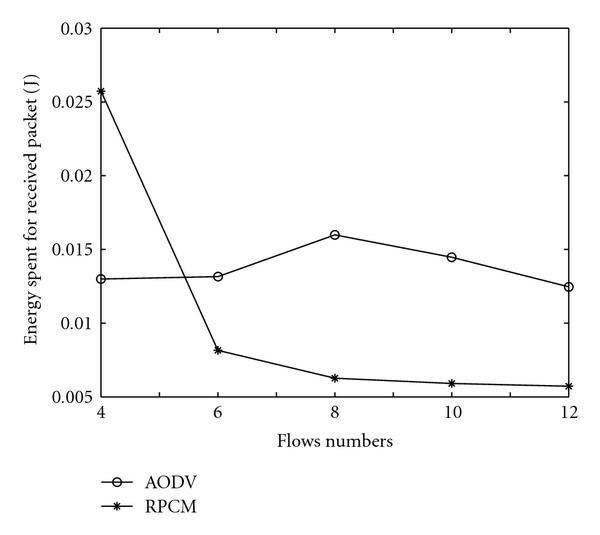 From Figures 9 and 10 we see that, for RPCM, we can determine a "threshold" on the number of concurrent flows, until it is below 6, the performance is constant with very high throughputs and very low delays, when the number of flows is higher than 6, then the performance worsens.This result gives the designer a good hint about the number of concurrent flows to allow into the network, in order to have high performance. 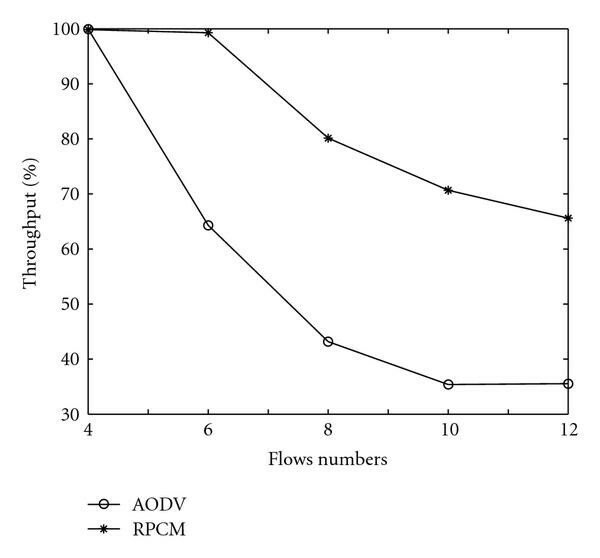 At least, the energy spent for received packet shows two different trends for AODV and RPCM, the first is not very affected by the number of flows and oscillates between 0.012 and 0.015 while the second shows a negative exponential bahavior for the energy spent on average is 0.025 but it reduces till 0.005 when the number of flows increases. In this work we focused on both the novel concept of controlled mobility and the routing algorithms. The concept of controlled mobility has been introduced in some previous recent work, but it has only been considered from an analytical point of view or in a marginal fashion, such as only a mobile base station in the network. 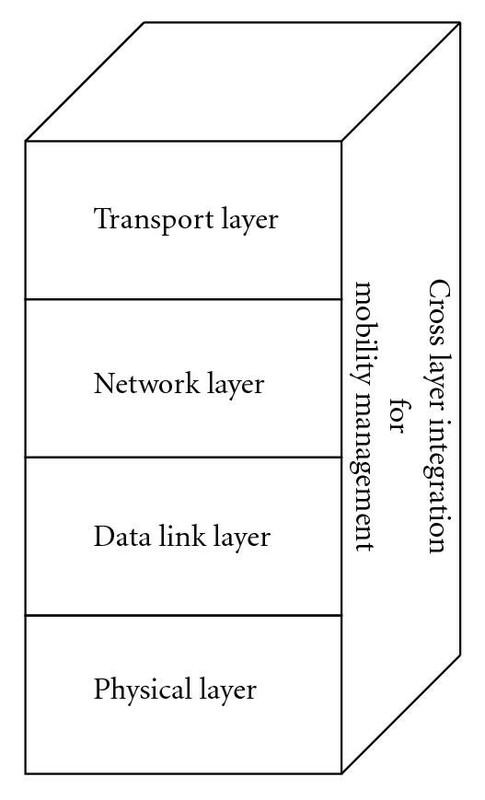 In this paper we focus on the controlled mobility as a new design dimension and we exploit it by implementing a new routing protocol based on controlled mobility. The most important aspect of this is related to the evaluation performance based on the usage of a well-known simulation tool, ns2. In fact, in previous works the analytical approach limited the use of controlled mobility while in this context, thanks to the simulator, we have been able to consider many realistic aspects of the network, while a routing protocol is implemented. Extensive simulations have been conducted and simulation results have shown how the new routing protocol outperforms a well-known routing algorithm, the AODV. Furthermore, results obtained suggest that other metrics can be easily realized and tested by simulation. In fact, as future works, we intend to study other optimization metrics such as the maximization of the network lifetime or the minimization of the average (or the maximum) distance travelled by nodes belonging to a path.